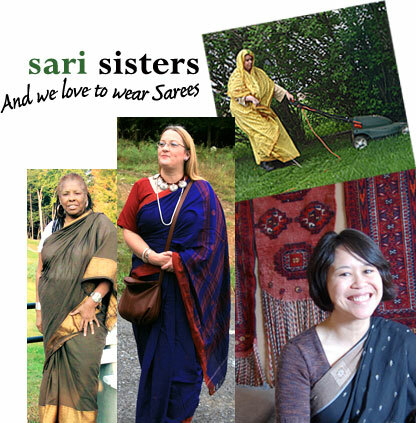 We don't know why, but we are compelled to wear saris. In the rapid roar of the fashion mainstream we have found something uniquely elegant, captivating and incredibly comfortable to wear, something that never goes out of style and will always fit you. We refuse to be hemmed in, literally, and prefer the style, a style uniquely our own, made by our own hands to our best proportions. Nothing can and never will fit you quite like the sari fits itself to you with your own hands and experience with your own body. The more we know, the more we learn to love so many subtleties of this textile. The delicate ornaments of each type of sari, the subtle weight and textural differences in the cloth and then there is the fine color sense of the weavers. There is more variety of color in interesting combinations to be found in this textile pallette than any other dress fashion available today. Mass markets have locked our choices into trendy seasonal sameness. The sari in its myriad forms takes you on a 0 - 60 thrill ride of gargantuan color options, from the subtle pastels to the brilliance of carmine and peacock blue. I've been saving your interesting comments for a few years and would like to offer them back for inspiration to all. 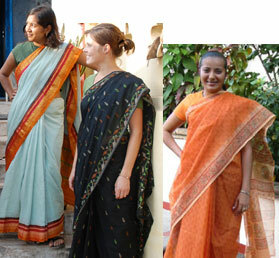 Read what other lovers of the cloth have to say about their sarees. Please enjoy these pictures and stories of real women just living their lives, and even mowing their lawns, but doing it gracefully in the gentle folds of the sari. For further inspiration and to see more pictures of beautiful women in saris, please take a look at this photo gallery of sari drapes or go off with some friends on an afternoon bike ride in sarees.